The number of priests in the U.S. has fallen by 7,424 since 2000 (-16%). The number of parishes without a resident priest pastor has increased by 653 to 3,496 (+23%). Although ordinations are up these remain insufficient to maintain the population of priests due to retirements and deaths (CARA). During the spring and summer every year the Vatican release’s the Annuarium Statisticum Ecclesiae (ASE) and in the U.S., The Official Catholic Directory (OCD) is published. CARA updated and expanded its Frequently Requested Church Statistics page. CARA compares the U.S. data in the 2014 OCD to the numbers released in 2000. Ordinations have increased by 12% since 2000 and the number of seminarians enrolled has increased by 5%. That being said, overall, the number of priests in the U.S. has fallen by 7,424 since 2000 (-16%). The number of parishes without a resident priest pastor has increased by 653 to 3,496 (+23%). Although ordinations are up these remain insufficient to maintain the population of priests due to retirements and deaths. The number of permanent deacons who have gone from 12,378 in 2000 to 17,464 in 2013 (+41%). Essentially the Church now has enough deacons to have about one in every parish. The number of lay professional ministers (excluding vowed religious who serve in parish ministry) has also increased from 17,315 to 21,424 (+24%) or to about 1.2 per parish. Although the number of deacons and professional lay ministers are increasing there may be trouble ahead as there are fewer preparing to add themselves to these ranks. The number of permanent deacon candidates has fallen by 19% and the number of people enrolled in lay ecclesial ministry formation programs has dropped by 27% since 2000. The parish-affiliated Catholic population has grown by 11% and the self-identified Catholic population has grown by 7% since 2000. Self-identified Catholic population has added 5 million. A significant portion of this growth has come from foreign-born Catholic adults which have increased by 4.4 million. 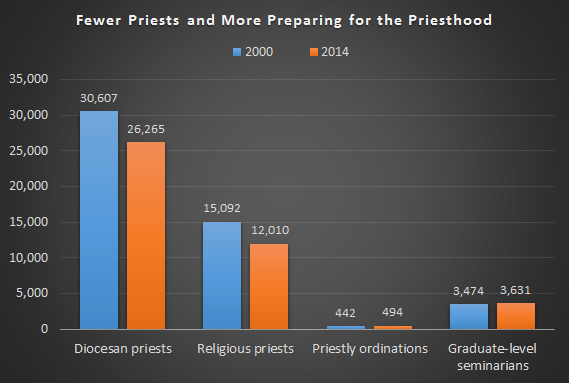 The ratio of active diocesan priests to parishes has decreased from 1.2 to a precarious 1.0. Although more parishes are without a resident priest pastor the Church has decreased the number of parishes where pastoral care is entrusted to a deacon or lay person (Canon 517.2) from 447 in 2000 to 388 now (-13%). Essentially, in many dioceses, parishes are being closed rather than having these entrusted to a deacon or lay person. CARA’s survey-based estimates of Mass attendance show a slight uptick from 22% attending weekly to 24%. With a growing Catholic population that means nationally the Church has seen the number of Catholics who go to church every week increase by more than 2.6 million since 2000 (+17%). Note: The ASE, upon which the world data above is based, is released two years after the most current year measured. Thus, the ASE 2012, which was released in 2014, represents 2012 totals. All previous years in the world table above measure the actual year listed. For 2014, there are no more current world data sources available.